An American Airlines passenger was taken into custody on Friday after touching people’s faces, spraying them with an unknown substance, and then jumping out the plane after landing. Citing a Phoenix Police statement, The Arizona Republic reported that the 25-year-old man was acting strangely during the flight from Minneapolis. Police said he could face trespassing charges after his bid to escape the plane at Sky Harbor International Airpor. None of the passengers on board wishes to press charges. 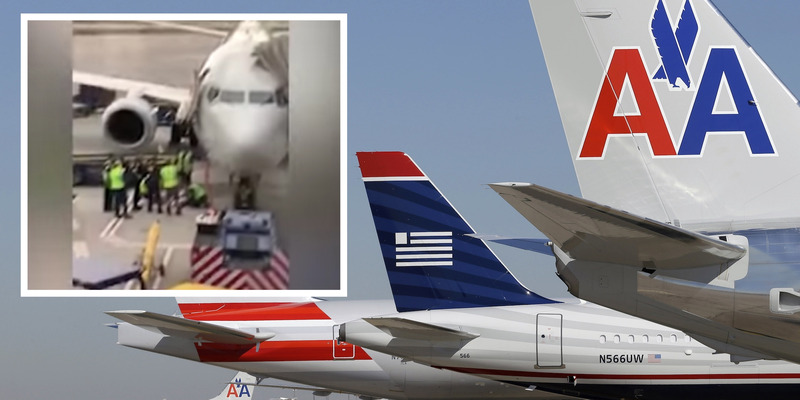 An American Airlines passenger was detained on Friday after a peculiar outburst on a flight to Phoenix, which culminated in him leaping from the plane onto the tarmac. According to a report in The Arizona Republic, owned by the same media group that runs USA Today, the incident took place on flight 1346, which landed at 6:12 a.m. local time at Sky Harbor International Airport, Arizona. Citing a Phoenix Police statement (carried in full here by local news site the Phoenix New Times News), the Arizona Republic said a 25-year-old man was acting strangely during the flight from Minneapolis. He was randomly touching the faces of other passengers and spraying them with an unknown substance from a bottle. After landing, he was brought to the front of the plane to disembark before other passengers, where he was due to be met by law enforcement. While waiting for the plane door to open, he opened a service door on the other side of the aircraft and jumped onto the tarmac 10ft below. According to the police statement, he was stopped by airport workers after his dramatic escape bid and was taken into custody. Police said the man was taken to a local hospital for treatment and could face trespassing charges. None of the passengers on board wishes to press charges, they added. The video was taken by Hannah Johnson, a passenger on flight 1346 who was sitting three rows in front of the man in question. She told The Arizona Republic that he was acting aggressive and stood up as the plane was preparing for landing. Johnson said he tried to hit other passengers, including her.